George William Allan was born in the town of York in 1822 on his father’s Park Lot and would go on to be an important figure in Canadian politics. Allan served with the Bank Rifle Corps during the 1837 Rebellion and became a Toronto Alderman in 1849. He was Toronto’s 11th Mayor serving from 1855 to 1858 when he became a member of the Legislative Council. Following Confederation, in 1867 he became one of the first members of the Senate. Allan was a member of the Upper House until his death in 1901. On March 24, 1819, George Allan (sr) purchased Park Lot 5 which was one of the 100 acre lots that ran from Lot (Queen) Street to Bloor Street. These long narrow lots (660 feet wide by 6,600 feet long) were generally given to men of importance and this lot had originally been granted to Cheif Justice William Osgood who lost the land patent for failing to build a house and live on the land. Lieutenant Governor John Graves Simcoe had planned the lots as a means of attracting an upper class to help manage the town of York. Unlike most settlers, these men had only to built a home and live there or rent it out to gain ownership. The grounds around Allan Gardens contain some of the downtown core’s mature trees. The city grew quickly and soon these Park Lots became prime development sites with each property owner able to do pretty much whatever they wanted to. They could build roads across their lots where they desired and this is the reason that most of the east-west streets in this section of town only run a few blocks and then end. George Allan built a palatial home on the south end of the lot that became known as Moss Park because of all the moss that grew on it. The desire for profit led to the quick development of most of the Park Lots with the result that there were very few areas set aside for public parks. In 1858 George Allan donated 5 acres of land to the Toronto Horticultural Society to create what has become one of Toronto’s oldest parks. The use of symmetry extends from the greenhouses to the grounds themselves and a pair of walkways enter from opposing corners to meet in front of the greenhouses. In April 1854 Allan had released his plans for the development of Moss Park with villa style lots. The area that would become Allan Gardens was laid out with four homes on each side and a large oval park in the middle. Two years later the Toronto Horticultural Society had been given use of 5 acres to develop as public gardens which they would later expand to 11 acres. September 11, 1860, marked the official opening of the Horticultural Gardens with the Prince of Wales on hand for the ceremony. A pavilion had been built that year for the opening ceremonies and a second pavilion was built in 1879 however, it burned down in 1902. It was replaced in 1910 by the Palm House which is seen in the cover photo. The picture below shows the inside of the Palm House, looking up. This Toronto Archives picture of the Palm House from 1913 shows the building shortly after construction and without any of the additional greenhouses that now flank it north and south. A photo of the building today shows a much different skyline in the background. Also of interest is the change in the location of the doors. Gone is the single central door which has been replaced with two doors located on either portico. The four corinthian columns across the front have also been removed. George Allan died on July 24, 1901, after which the park was renamed Allan Gardens in his honour. Today there are six greenhouses with a combined area of over 16,000 square feet. A seasonal display pays tribute to the harvest with this statue which is out of its gourd for a fancy dress. The tropical house was moved from Exhibition Park to this location in the 1950’s and has a chrysanthemum display as a feature this month. The ‘pumpkin’ below will continue to bloom and will create a colourful display as the month progresses. Additional greenhouses were built in 1924 and 1956 to expand the conservatory’s collection of plants and flowers. The Arid House (Cactus House) was also moved from Exhibition Park in the 1950’s and contains many different species of cactus. The Golden Barrel Cactus, also known as Mother-In-Law’s Cushion, is native to Mexico where it is endangered in the wild. Mature plants can live for 30 years and will only begin to have flowers after about 20 years. The small yellow flowers that grow near the centre turn into a fruit that contains seeds for the next generation of plant. These cacti also spread through a root system and corms. Allen Gardens has several of these cacti that are quite large but none that are near the one-meter size that they can attain. Allan was a strong supporter of the arts and was a champion for Paul Kane and James Audubon in the years before they became popular. It is fitting that the park he created is home to a statue of Robert Burns which was erected in 1902. Allan Gardens originally did not extend to Jarvis Street and that side of the property was built up by the late 1870’s. Two historic churches remain one on either corner of the grounds, with the Baptist Church being on the corner of Carlton and Jarvis. This Gothic Revival church was built in 1874 from Queenston Shale and opened in 1875. This is the third building to be occupied by this congregation which had organized in 1829 on Lombard Street. The lone remaining house in this block is now used as the Toronto Baptist Seminary and is next door to the church. A couple of other houses and a Collegiate Institute have been removed and now St. Andrew’s Church stands alone on the north corner. 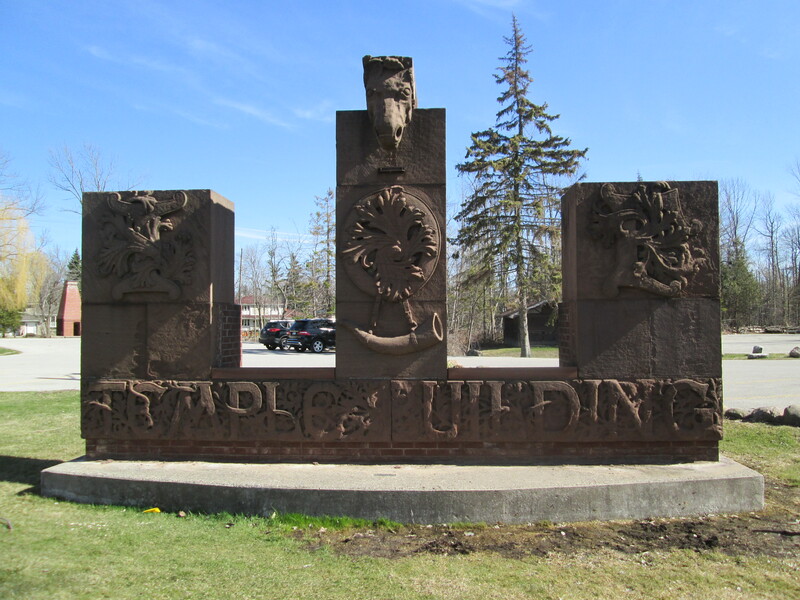 It was built in 1878 of Credit Valley Stone and was used by the Presbyterian Congregation that moved here from their old building at Church and Adelaide. Estonian and Latvian refugees acquired the church in 1951 after being displaced during World War II. The Allan Gardens greenhouses are open year around from 10 am to 5 pm every day. They have seasonal features that make repeated visits enjoyable. This entry was posted in Estates, Toronto Historical Buildings and tagged Allan Gardens, Golden Barrel Cactus, Jarvis Street Baptist Church, St. Peter's Presbyterian Church on October 11, 2016 by hikingthegta. 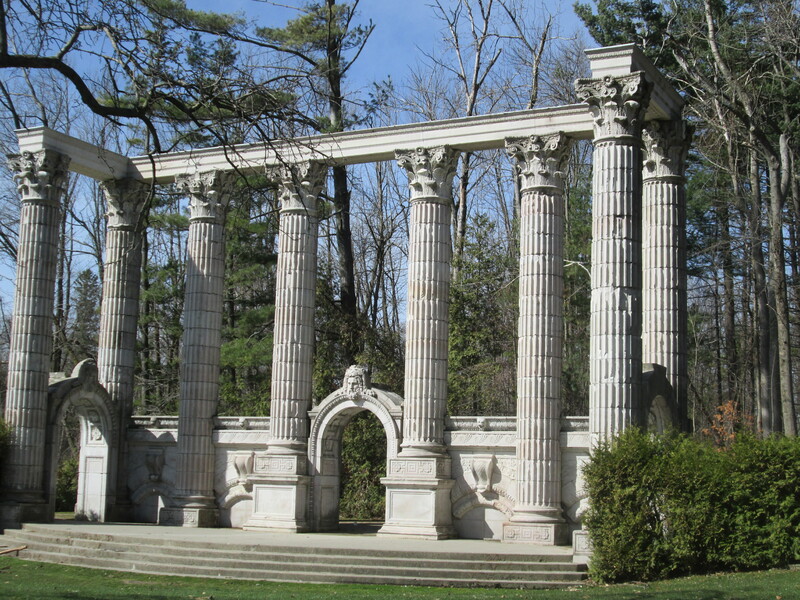 I went to Guildwood park because the second oldest house in Toronto is preserved here. I found the house and a whole lot more. I parked in the parking lot of the former Guild Inn and went for a walk in the cool sunshine. In 1795 Augustus Jones, who had surveyed Yonge Street, was commissioned to survey Scarborough. 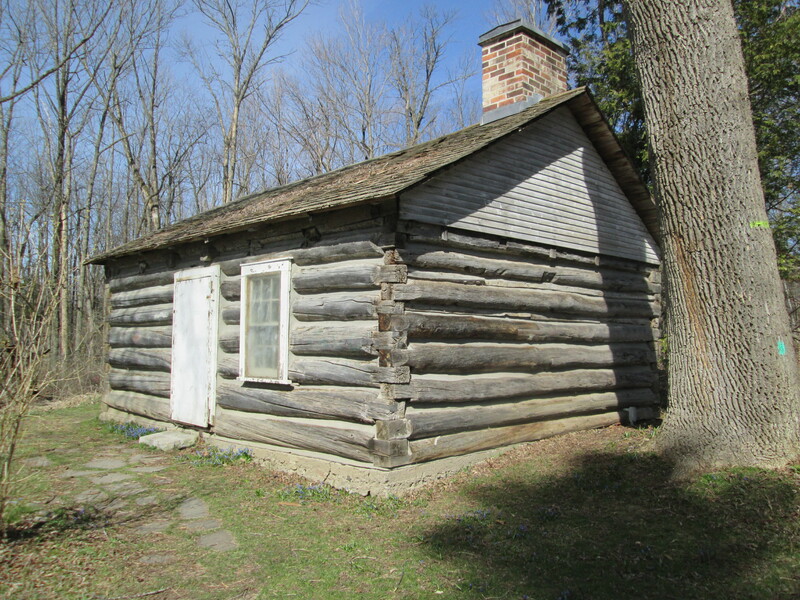 It is said that Jones built the log cabin on the property for his crew to live in during the work but records show that his men lived in tents at this time. Regardless of the details it is generally accepted that this is the oldest house in Scarborough and the second oldest in Toronto. 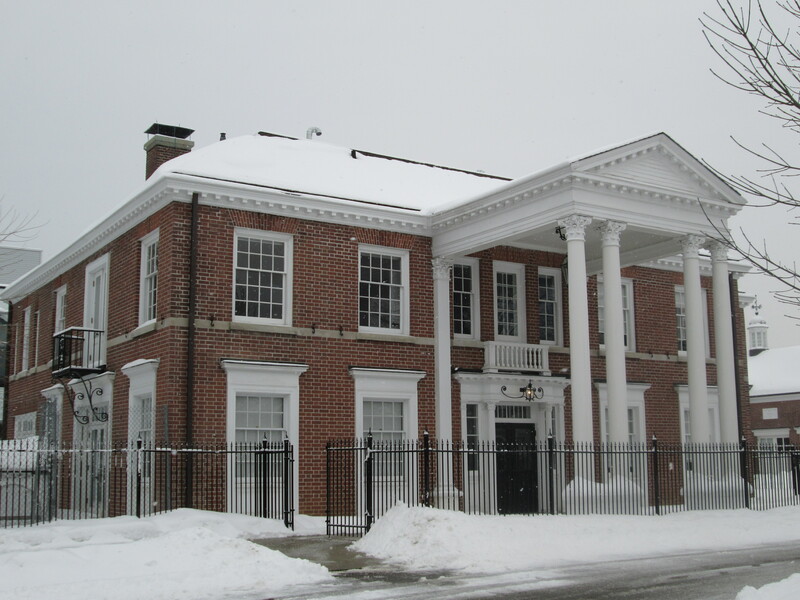 The property was originally granted to William Osterhout in 1805. 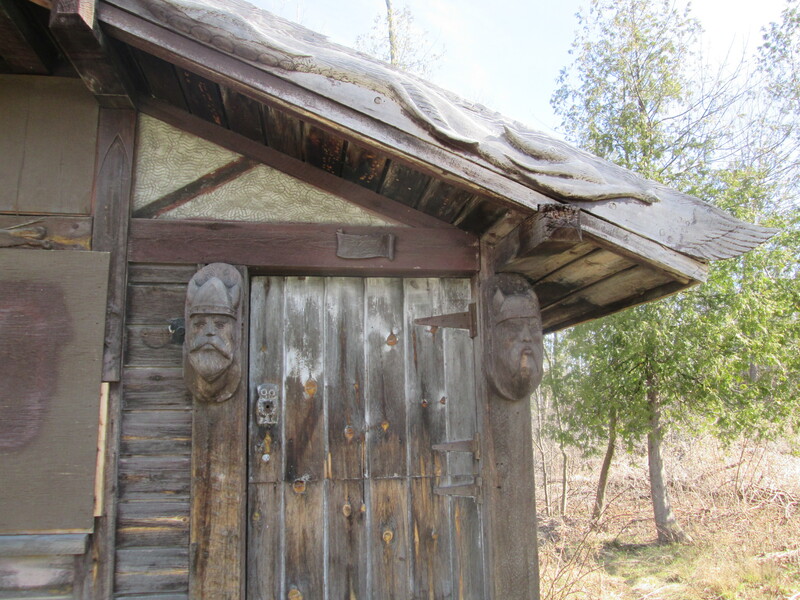 Over the next 100 years a series of owners lived on the property. In 1914 Colonel Harold C. Bickford built his country estate on 40 acres of land with a view over lake Ontario. His 33 bedroom mansion, known as Ranelagh Park, is featured in the cover photo. Bickford fought in the Boer war, was a Brigadier General in the First World War and then led anti-Bolshevic forces in Russia following the war. 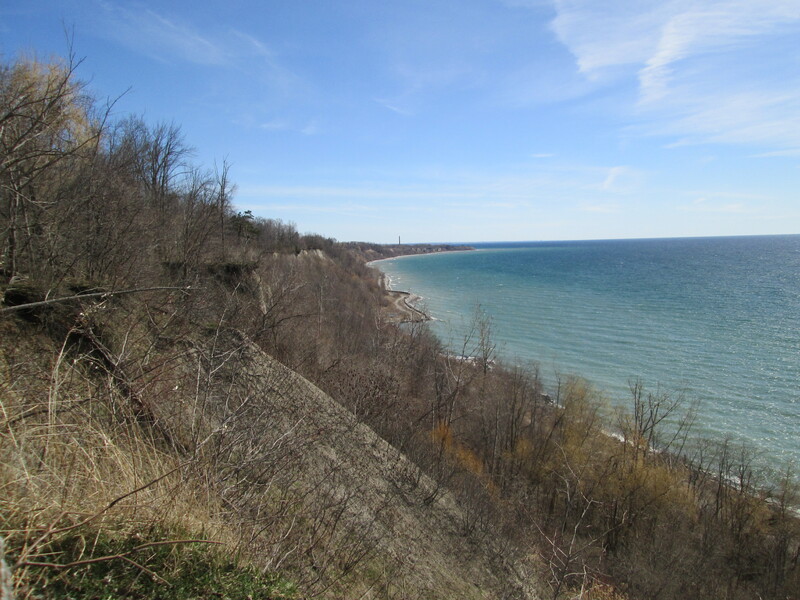 He and his family enjoyed the view from atop the Scarborough Bluffs for only a few years before the house was sold in 1921 for use by an order of Catholic Missionaries. Over the next ten years it also served as a home for a wealthy business man and finally it sat empty for a couple of years. 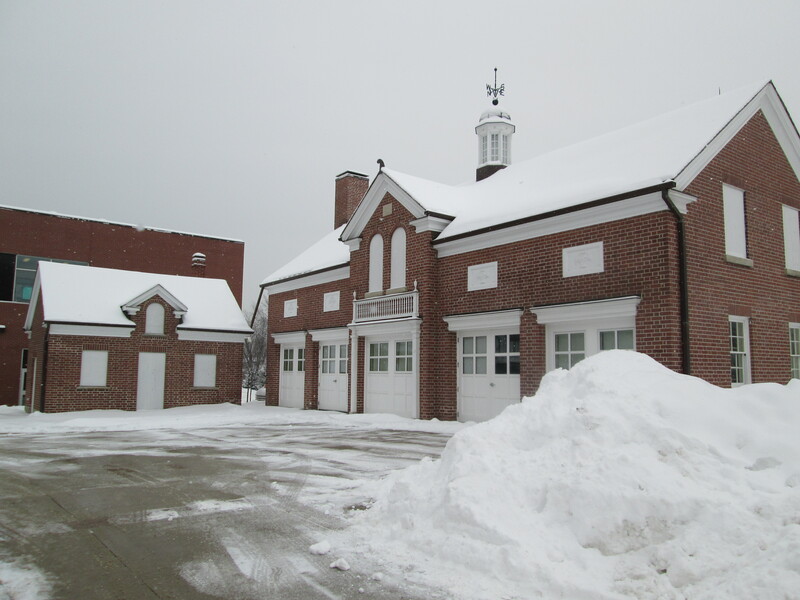 In 1932 Rosa and Spencer Clark took over the property and started the Guild of All Arts. Under their management the property was expanded with additions to the house being made throughout the 1930’s and 1940’s. A 6 story hotel tower was added in 1965 to accommodate all the people who were visiting the artist colony. The tower sat empty from 2001 until 2009 when it was demolished. The picture below shows the sprawling mansion as it looks today with all of its additions. 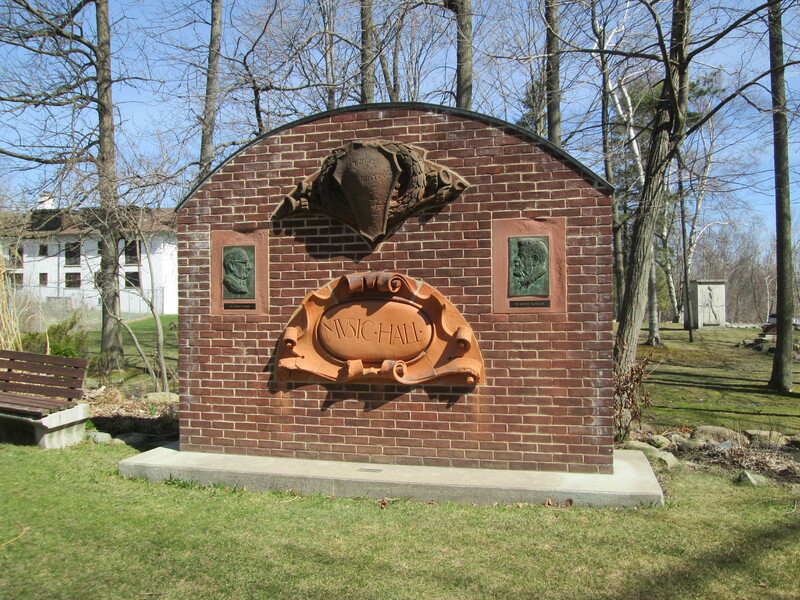 In 1940 a sculpture studio was built. Various artist worked here over the years including Dorsey James who created the Norse carvings on the door and along the roof line in 1970. The Guild sits on top of the Scarborough Bluffs with beautiful views out over the lake. During World War II the property was operated by the Women’s Royal Navy Service. In 1947 it was returned to the Clarks who picked up where they had left off. They became concerned that much of the late 19th and early 20th century artwork that decorated buildings in Toronto was being destroyed to make way for new development. 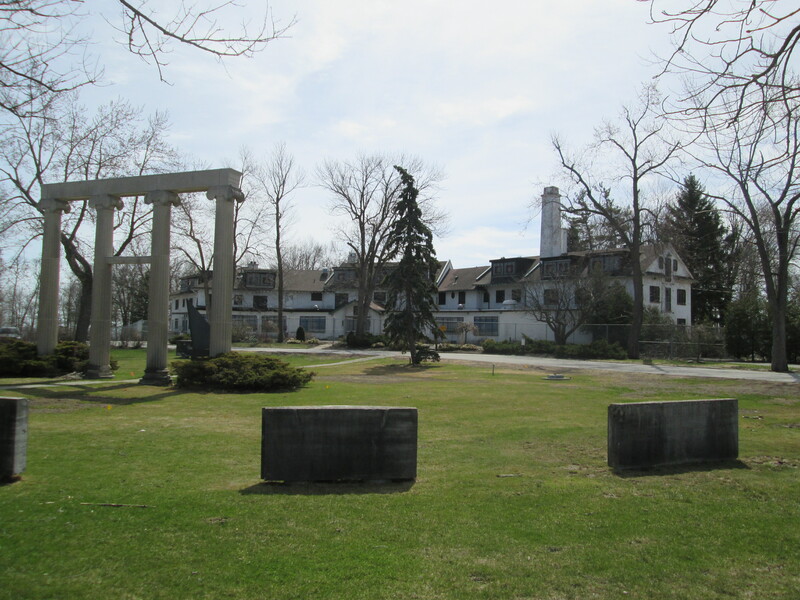 They started to collect or buy interesting parts of demolished buildings and move them to the Guild Inn property where they had them re-assembled. Today there are parts of over 30 buildings on display on the grounds. The four Corinthian columns in the picture below stood at the entrance to the Banker’s Bond Building at 60 King Street West. 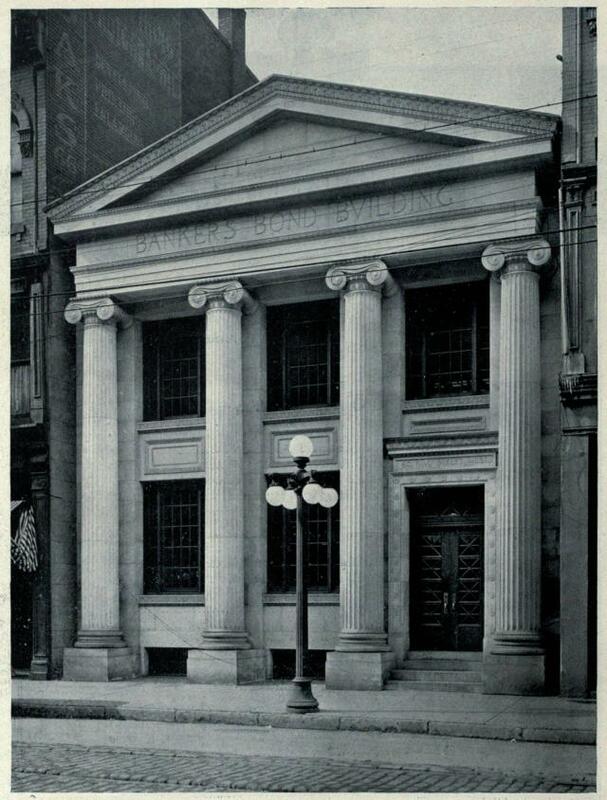 The Banker’s Bond building was constructed in 1920 and demolished in 1973. The building originally looked like this. The street address sign stood over the doorway but was placed in the middle when the columns were put back together. 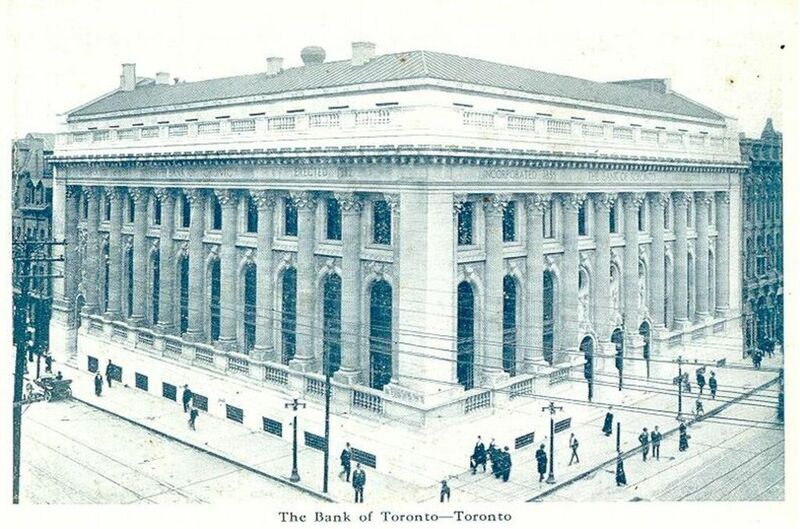 The Bank of Toronto stood on the south west corner of King and Bay streets from 1912 to 1966. The bank was founded in 1857 by George Gooderham, son of William Gooderham who owned Gooderham and Worts distillery in Toronto. The bank merged with The Dominion Bank on Feb. 1, 1955 to form the Toronto Dominion Bank. 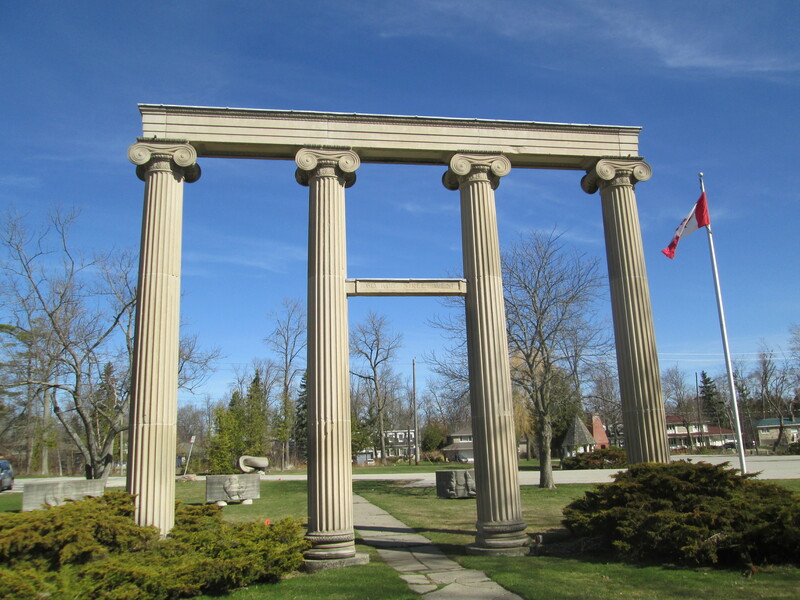 The columns in Guildwood Park have been set up in a different configuration than the original building. The three arched entrances have been split up and placed on three sides of the monument. The Bank of Toronto building in 1915. The three arches were located side by side at the entrance to the bank. The Canadian Bank of Commerce has stood on the north west corner of Yonge and Bloor for over a century. 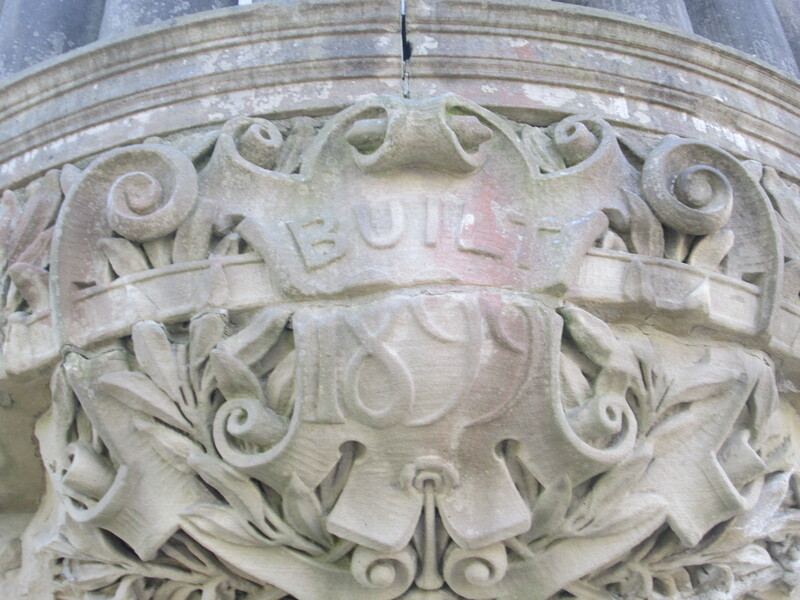 This ornate date stone was rescued from the 1899 building. It was removed in 1972 to make way for the new 34 story tower that CIBC built at Two Bloor West. The building as it appeared in 1922. 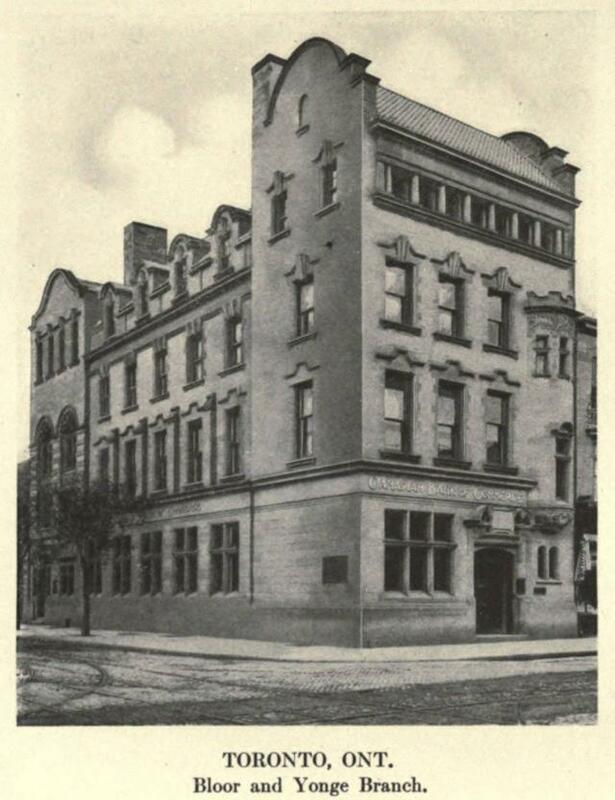 The Temple Building was constructed in 1896 on the corner of Bay and Richmond Streets. It was built as the international headquarters for the Independent Order of Foresters who claim to have originated in the 14th century in England as a friendly society caring for the sick. I love the horses head on the top of this piece. At 12 stories it was the tallest building in the city upon completion. It was demolished in 1970. The Royal Conservatory of Music was founded in 1886 as the Toronto Conservatory of Music. 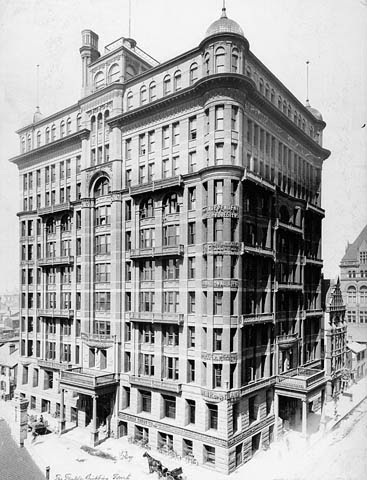 Their building at College Street and University Avenue was built in 1897 and demolished in 1968. 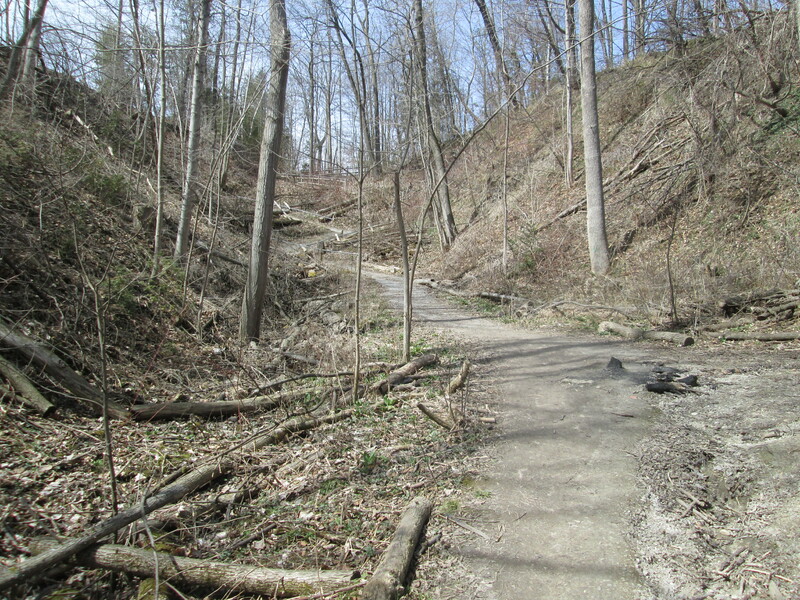 A trail winds it’s way down the hill to where an old construction road leads to the edge of Lake Ontario. It practically cries out to be explored. Perhaps another time. Today the Guild Inn sits empty once again. The signs in the window declare it to be a hazard due to asbestos and mold. It’s future is in question. Will it get cleaned up or demolished? This entry was posted in Estates and tagged Bank of Toronto, Canadian Imperial Bank, Guildwood Park, Scarborough Bluffs, The Guild Inn on April 23, 2015 by hikingthegta. Family emergencies precluded any extended hike this weekend but I was able to take a few minutes to visit an historic estate in my neighbourhood. Frank O’Connor was born in Desoronto in 1885 and after marrying Mary Ellen Hayes he moved to Toronto. In 1913 they opened a small candy store at 354 Yonge Street. The city was busy celebrating the 100th Anniversary of the Battle of York (Apr. 27, 1813) from the war of 1812. To capitalize on the current air of patriotism the O’Connors decided to name their candy store after Canada’s most famous war heroine and mark the 100th anniversary of her legendary walk. On the evening of June 21, 1813 the American military entered the Secord home in Queenston and forced Laura to serve them dinner. After dinner she overheard their plans to carry out a surprise attack on the small British force at Beaver Dams (Thorold). The following morning she began a 10 mile journey through swamps and briers to the stone house where the British lieutenant James Fitzgibbon was stationed. As she climbed out of the swamp several hours later she was surrounded by a band of Iroquois who escorted her to her destination. After an ambush by 400 Indian warriors, the American forces were ready to surrender and Fitzgibbon took 462 prisoners. 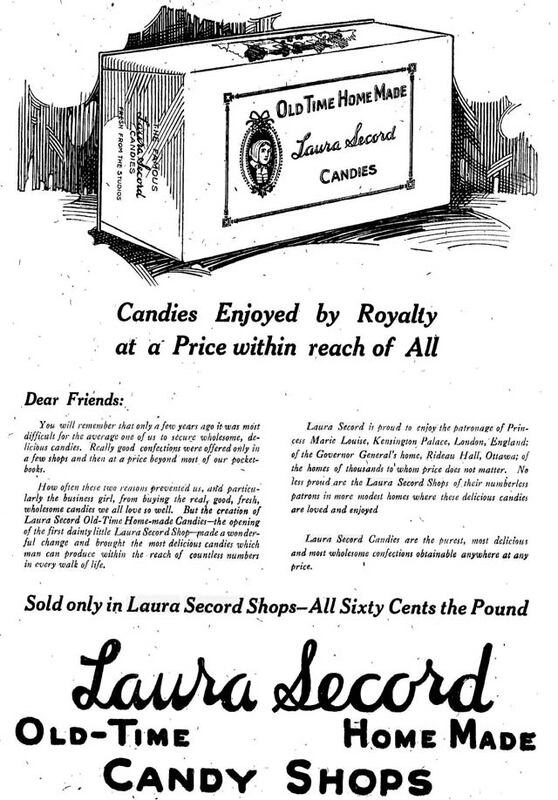 Laura Secord’s advance notice of the impending attack led to a decisive British victory and the use of her name led to a successful candy franchise. Today there are over 120 Laura Secord stores, making it Canada’s largest chocolatier. In the early 1930’s Frank O’Connor had become wealthy enough to purchase 600 acres of land north west of Lawrence Avenue and Victoria Park Avenue on which to build his estate. He built stables, barns and raised a herd of Ayrshire cattle. His prime Clydesdale and thoroughbred horses were shown each year at the Royal Agricultural Winter Fair in Toronto. Frank named his farm Maryvale after his wife, Mary. The restored house stands near today’s Rowena Park. The coach house has been restored for use as a conference centre while the smaller maintenance building on the left remains shuttered and off limits to the public. 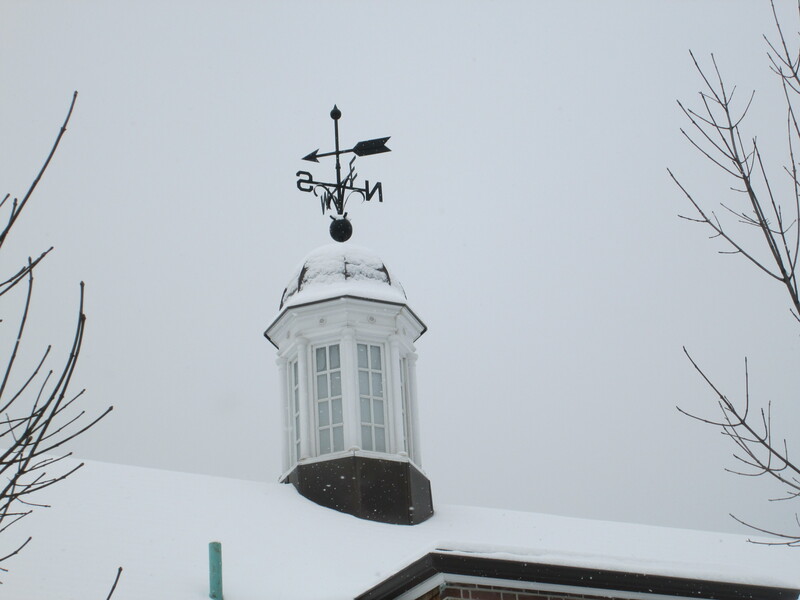 The cupola on the coach house has a weather vane on it with the four points of the compass and an arrow to indicate the direction of the wind. All three of the remaining buildings were constructed at the same time. 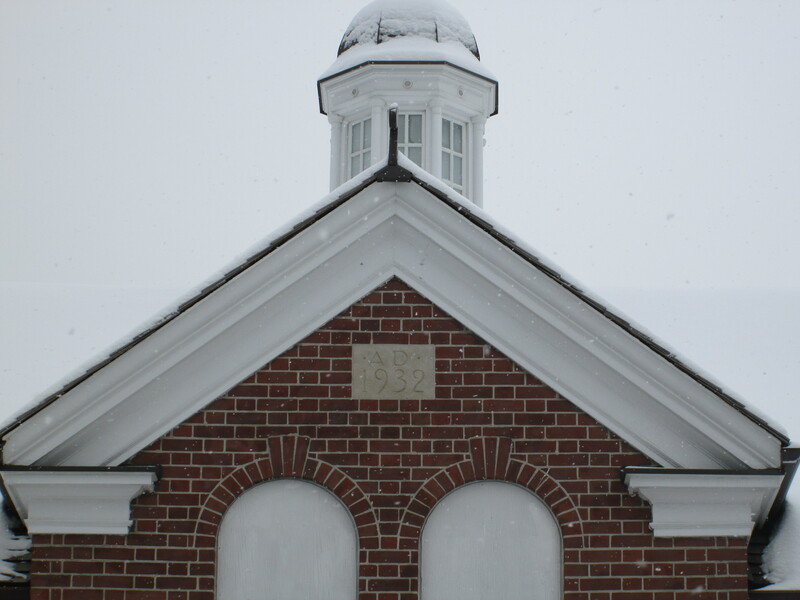 The date stone was placed in the coach house and it reads 1932. Frank O’Connor was a key player in the Liberal Party of Ontario and helped Mitchell Hepburn win the 1934 Ontario election to become the Premier of the province. He was also involved in the federal election of 1935 in which Liberal leader William Lyon Mackenzie King became the 10th Prime Minister of Canada. The cover photo shows Prime Minster King on the left, Premier Hepburn on the right and O’Connor in the back (like a typical back-bencher) on the steps of the legislature. For his loyalty, O’Connor was awarded with a senate position in 1935. O’Connor routinely gave his fortune away to several charities and when he died in 1939 he bequeathed his estate to a local religious community. Over the year’s the estate was sold off for development and by the year 2000 the three remaining buildings were unoccupied and in danger of demolition. The efforts of local community groups as well as federal, provincial and local governments were required to make the restoration possible and save the buildings, which have since been designated as historical sites. O’Connor Drive is named after Senator Frank O’Connor. This entry was posted in Don River, Estates and tagged Frank O'Connor, Laura Secord, Senator O'Connor on February 22, 2015 by hikingthegta.